I had friends popping around unexpectedly on Friday morning and there was nothing to give them, so I needed a quick, tasty, gluten free biscuit that I could have done and cooling by the time they arrived. 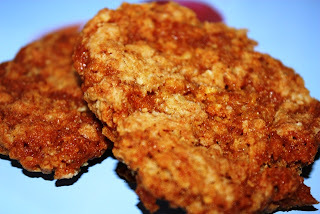 I went to my trusty Porridge book and of course good old Margaret Briggs had this recipe for School Dinner Oat Cookies. In a school she worked in years ago they served these with blancmange. How very Enid Blyton! These make a crisp, sweet, chewy biscuit. Impossible to eat just one. Place on greased tins, leaving space - they spread!